I don’t know why Vin Martin isn’t on this one. Front row from the left; Kath Fllyn, Margaret Ahbrams? Marjorie Kilcoyne (my mum), ? Dalton Headteacher, Chris Laird, ??, ? ?, ??. Back row from the left: Art Teacher ? Mick Spain, Woodwork Teacher, Len ?, ? ?, Frank ? and ?? Photograph and details courtesy of Lesley Wilson. Think this is later than the early 60s. I was at St Patrick’s. Left in, I think, 1964. Mr Dillon changed my life totally and I can never be too grateful to him. In my final year there we moved to the new site and having done very little science, Mr Dillon, then the new science teacher, offered to give us extra lessons at lunch time and after school in preparation for the Northern Counties Examination. After a few weeks, only myself and another pupil, Anthony Kane, were left attending these extra classes. Mr Dillon never missed an extra session the whole year. Anthony and myself passed with identical marks. I moved on to Stockton and Billingham Technical College where I passed O and A levels before getting a BSc at Lancaster University and a PhD following research at Miami and Leeds universities. Thank you Mr Dillon. I often wonder what happened to Anthony with whom I lost touch. As I recall, Miss Finn, who taught me English, was lovely as was Dan the woodwork and technical drawing teacher. Most of the others seemed to rather look down on us as failures. It was lovely to see photo of some of my teachers was certainly a blast from the past. We lived in The Avenue and my dad (Mick Brannan) used to clean your windows in Barker Road. Your Mam used to teach French and English until Mr Dalton deemed French to be of no use to us kids and this stopped. I loved French and your Mam was a great teacher. I was also at the pat’s with Jeff Milon, Peter Conney, David Scott. We are all in our 70’s now, where have the years gone? Ben Gunn was our teacher. Next to Mrs Kilcoyne is Miss Howard. Cookery teacher. Far right of photograph, back row is Peter Cook, taught science. Believe he left early 1970s for promotion at a school in Lancashire. This picture takes me back, great teachers from a great era. Mr Dalton liked using the cane too, was at St. Patrick’s 70-75. I think this must be year 1968. I have a photograph year 1 of 1. Mrs. Armitage was our teacher and she is wearing the same dress in the class photo. I wonder if the photo was taken the same day. I really enjoyed my school days. Next to Kath Flynn, Mrs Charlton Needlework teacher, Mrs Kilcoyne (a wonderful teacher! ), Mrs Howard, Not sure about the next two ladies (could be student teachers) between Mr Laird (Inspirational man) and Mrs Armitage. It was about 1968. I was at St. Pats from 1953 – 1963. 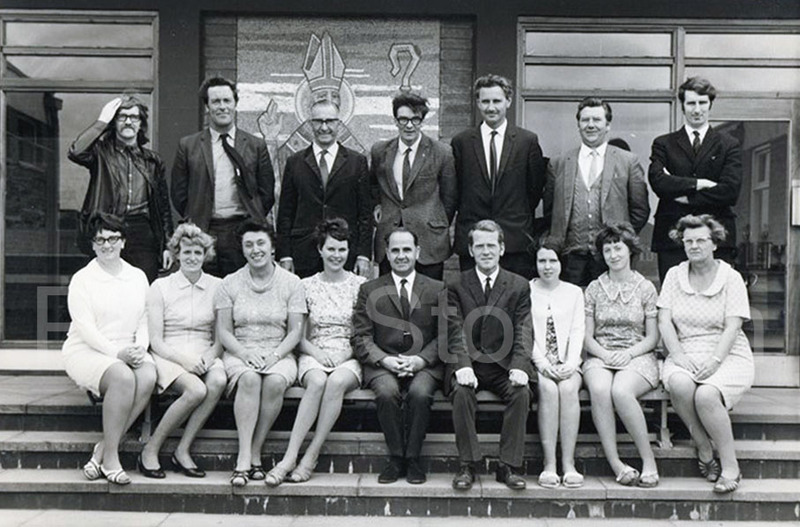 I think the photo was taken in the late 1960s, Vin Martin left in the early 60’s to teach at St Anthony’s in Middlesbrough so that’s why he isn’t on the photo. He was a good teacher and a gentleman. I met Vin about 35 years ago, he was playing snooker with my father-in-law Basil Goult in the Middlesbrough Conservative Club. Basil and his family lived in Barker Road, Thornaby in the 1940s/50s. I had many a drink and a few games of snooker with Vin over the years until he sadly passed away. Chris Laird one of the other teachers was also a very good teacher. I got talking to Mr Laird at Cochrans Club on Hall Drive, Acklam approx 18 years ago, I was playing bowls at the time and he came over to watch. After the game I introduced myself to him and surprisingly he remembered me from school. While I was talking to him, I kept on calling him Sir and being the age I was (50 years old, married with 4 children) he found it funny, but because I’d always respected him I couldn’t stop myself. I attended St Patrick’s secondary school from 1959-63. In that period all pupils were based in the ‘huts’ on Thorntree Rd. The buildings were pretty rudimentary- made of pre-fabricated concrete. Those days are still retain a fondness in my memory. Before I get too nostalgic, I just wanted to add a little more information to the published photo of the teaching staff at St Pats. I’m assuming that the lady who uploaded the photo, Lesley Wilson , is was formerly Lesley Kilcoyne? I think the teacher in the front row on the left is Kath Finn. Lesley correctly identified the Woodwork teacher, his name was Daley, whose nickname was Dan, after the Hollywood actor/dancer. Just one more little bit of info. On the back row 2nd from the end on the right, this teacher was called Gunn, he also had a nickname of Ben, from the Robert Louis Stevenson in Treasure Island. It was wonderful to come across this photo, but saddened to read in The Gazette about the passing of my old Geography/Music teacher, Mrs Kilcoyne. Does anyone remember my father in law, Mr Frank Costello who taught at the St. Patrick’s primary school? Yes I believe he rode a motorbike to school from near Whitby or out that way. If this is the same guy we used to like him very much. Before he went to St Pat’s he taught in Whitby and the family home was in Sleights. You are correct about the motor bike. His eldest lad Stephen has about 6 at the last count so the love of motor bikes has run in the family. I remember Mr Costello, he gave me the cane lol. Always had one leg up on the chair as I remember. I got the cane from him too. Hi Robert. My name is Sandra Dover. Are you related to the Dover’s in Stockton? My grandad was called Richard Dover. Judging from the attire, especially the long haired gentleman top left, I’d be surprised if this was as early as 1962. It looks more like early 70s. I like the Pope in the background “photobombing” the picture! It’s not ‘The Pope’ it is the Patron Saint of the School. St. Patrick.! The picture in the background is St Patrick. The art teacher, with the mustache is Mr Valentine. He went on to teach at Our Lady and St Bede’s RC Stockton. Sorry I haven’t found any yet but will post if I do. Who was your aunty and are you talking about Barker Road or Tweed Avenue? Hi Lesley it’s Eleanor Cartwright nee Riley its great to see these pics. I’ve lived in Norfolk since 1978 and don’t see anyone from school but great memories. Yes I am Gilpin Road flats, sorry to hear about your mum she was lovely. Sugar, I remember you from Johnson Grove, Norton. Hi, yes my sister lived there I lived with her for about 3 years. Doesn’t time fly. Where did you live? Across the road from Marsha & Dave at No 2. Hi where did you live? Hi yes I do remember you hope you’re keeping well, please say hi to Rosie and Dave Lambert for me. I’ve lived in Norfolk since 1979 so I never see anyone, great to know your all going strong. I lived next door to you in Tweed Avenue at No. 19 you were at No. 17. My name then was Pat Otterson and my brothers were David and John. I remember you all. Paddy, Francis and Lesley. Think your brother was born after you moved to Barker Road. I used to visit you there too and I remember your grandma. Back row: Art teacher took over from Miss Saunders. Mr Spayne, Mr Dailey, Mr Burke, Mr Duffy, Mr Gunn, Science teacher? Front row: Miss Finn, don’t know, Mrs Kilcoyne, don’t know, Mr Dalton, Mr Laird, don’t know, don’t know, don’t know. Yes now I remember my old teachers. Lesley if you read this would love to hear from you. You and your family lived next door to me in the 50s in Tweed Avenue. I was very young in Tweed Ave though Paddy or Fran will remember. She in Germany. What was your surname, Otterson? or Tonks? Just realised you told me Otterson. Not familiar with all this. I’ll email Paddy. I was only about 3 or 4 but I know your name so well. I have an abiding memory of playing in the road where the road widened in front of our houses:?? Derek, are you related to Dave Heatley who went to St. Pat’s and then SMC in Milddlesbrough? Jim. Sure am, Dave is my Brother. Come back to me via my e-mail address -please contact pictures@stockton.gov.uk and they will forward my email address onto you and we’ll discuss, Dave not well at the moment! Derek we left the Hut’s July 64. The new school was opened Sep 64.. Lesley I have fond memories of coming to Birthday party’s at your house. My sister Maureen was at school with Paddy.. Maureen O’Hara. How lovely that your mum is still with you please send her our love. I remember her she used to teach in the ‘junior school’. She was lovely. I left the Pats in 1956 but do remember most of these teachers. Really fond memories of Mr Laird [hard but fair]. Also when you mention Mary Howard do you remember her assistant Rhoda Hills [my mam]. Great days at school and lovely to see these pictures. Best regards to all. Mervyn Hills. Hi Merv, Remember me? We played against you, I was outside left for Arthur Head school, don’t want to mention the score!!! I am in touch regularly with Bob Wesson, he lives at a place called Appleby Magna not far from Coventry and he’s quite well and works for a garden centre near to where he lives (part time). His wife is not in the best of health unfortunately. I will mention you to him when I speak to him. Kind regards John Vincent. hope to get to Teesside next year. Give Bob my best regards. My mum is Robert Wessons cousin and is trying to trace him,his mobile number has changed and he isn’t at the pub now after Janet passed away. If you have any info my mum would be very grateful . Did Lesley Wilson have a brother called Douglas who attended Primrose Hill school on Durham Road in 1964 to 1967 as I would like to trace him, thank you from Dave Jones formerly of Hardwick now in Essex. I left “the pats” in 1959. Only 4 of teachers in this picture taught in “the huts”. Mr Spayne (Spanner), Mr Daley (Dan), Mrs Kilcoyne and Mr Laird. Sj Dalton was the head whose office was in junior school over the road. Other teachers I remember from the “huts” were Mr Martin and Miss Preston (Beryl I think). This photo was taken outside new school on Baysdale Road. Hello Lesley, thank you for posting this picture. The second from right at the back is Frank Gunn. Is your Mum still with us? Such a lovely lady, one of the very few teachers I have fond memories of. I agree she taught us English. Yes my mums now 97 and in a nursing home in North Wales near us and doing well. I think you probably knew Fran, I do recognise your name. Woodwork teacher is Dan Daley, back row middle (with glasses) looks like Mr Burke. I left in 77, and he was still there then.